Finally finished! 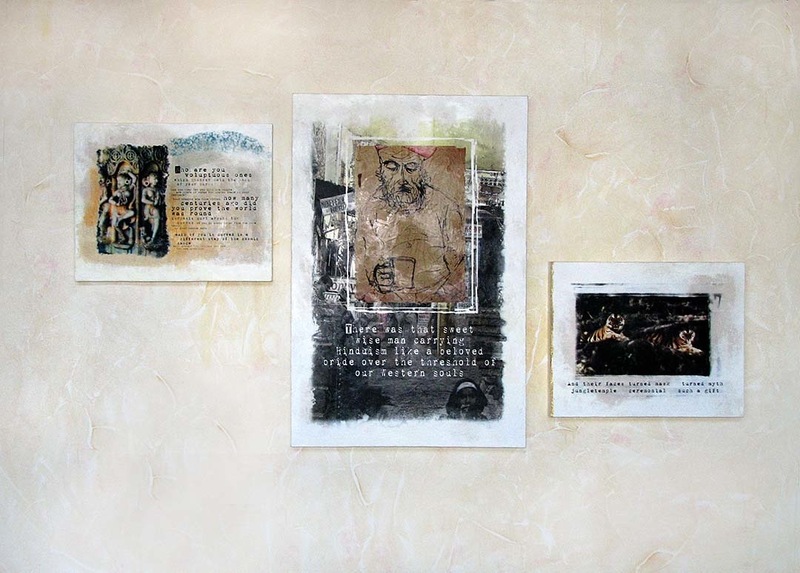 The art Bill and I collaborated on for 5 months is now up on the wall. His art, my poetry, and artistic decisions made by both. Though we each create independently, we learned so much from collaboration, that we couldn't working on our own, How to blend, without diluting. How to speak up for what doesn't work in a loving, non-alienating way. How to assist and take direction from each other. How to work with new processes (beeswax!) in a really patient way that respects that one of us is faster than the other. How we are both gentled and transformed by the process. It is almost too obvious to write of our highly competitive global economy, and how that com- petitive spirit trickles down to our relations with one another: Who has the best and latest? How even an art form as remote from popular culture as poetry can become a competition for prizes and positions - trophies on a mantle, as one poet wrote. 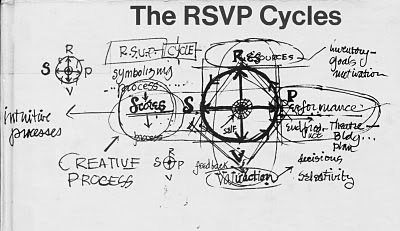 I’m very interested in collaborative models, and I turned to one called the RSVP Cycle, created by Lawrence Halperin in the 1960s. 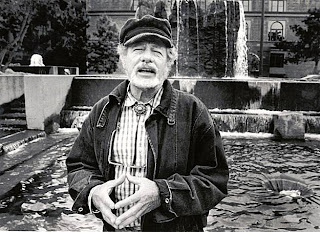 I have written about the Halperins before - Lawrence, the legendary landscape architect, and his wife and collaborator Anna, my 91 year old equally legendary dance teacher. The RSVP cycle was a way to make the process of design and the choreography of a performance less autocratic, and more inclusive of those involved - the clients, community and dancers. I think it is adaptable to many other activities as well. R is for resources, “both human and material.” The question is what’s available? For example, what is available to the Occupy movement? Computers, internet, Twitter, cell phones, open space, human ingenuity, and common concerns. If you can’t use amplifiers, the combined force of the human voice repeating the words of the speakers creates community as well as amplification. The intangible must be continually addressed: What are the objectives? S is for Score, and the focus is on “design, participation, events and activities.” As a choreographer, Anna tells her dancers what she wants them to achieve; the vision she has - but not how to achieve it. The dance itself arises from the internal and group process of the dancers. Adbusters, the Canadian group that first put out a call for activity like the Occupation, did not specify content or process. The Assembly of the Occupation, which meets daily, decides issues. V is for Valuaction. People’s feelings and belief systems must be incorporated into the process. The needs and desires of the clients, community or dancers, must be part of the process and the decision making process itself, must “respect, acknowledge, and incorporate these values”. We can see this operating in the Occupy movement. P is for Performance. The result of R, S & V is the product, and how it evolves over time. If we think of the cycle as a problem to be solved, the solution should be organic and “non-static,” and defined by those who use it, experience it, and appreciate it. Despite the highly competitive global economy, I pray for more and more collaboration on so many levels - it is our key to survival on this planet.